There is a space for patience in each one of us: the virtue of patience is one that every mother needs, not just, because there is a baby but because of another important employee who also doubles as member of the family, the nanny/ domestic worker. Having a live-in house help is not easy. When I was waiting for my first live-in hose help, I was anxious, wondering what sort of a human being she would be. I had not personally interviewed her. I did not know where to start so a colleague did the groundwork for me. I later reasoned that she must be as anxious as I was. I joined what my friend termed as “firing squad” but after that, I had the confidence of interviewing house helps and demanding to see them face to face to make a decision. I vividly recall after getting home from hospital, I did not explain to her that I had some emergencies in hospital and my health was not okay, but somehow expected some instructions like “do not disturb when resting” to be easy to follow. Imagine my shock when she knocked my door for the umpteenth time to ask “which cloth did you say we use for the table between these two”. I looked at her and said silently “Lord have mercy”. I do not recall what I told her but amazing I did not shout at her. I called my friend Rahma to bring table clothes to resolve this ‘crisis’. She promptly passed by later with some supply of kitchen towels. There are many times I see myself being more patient than I would have been over a year ago. Many things are not exactly within my control and other times I realize that I have to let things pass. I have watched patiently for baby to take different steps. There was a time I could not wait for him to turn the head, and then he could turn the body, and roll over. It was quite a milestone, yippy! Then after a while, it became part of the task since from then onwards, he does not have enough patience to lie still for enough seconds for me to successfully change a diaper. Somehow, this used to make my niece Angel very excited and the advert on diaper pants has never made more sense. At one time I was looking forward to the six months ‘birthday’ to start weaning, then first tooth, then one year and wondering when will he take a step. Every day he learns and I learn. Patiently. I remind myself that there was a time he could not turn the head, when I get tempted to wonder when he will achieve a certain milestone. Patience. God’s grace is sufficient: I enjoy hours of sleep. May be I should say, I enjoyed hours of sleep. Throughout my pregnancy, I had good nights of sleep, enough hours of sleep every night and any other time that my work schedule and my other schedules allowed. I was quite busy for some reason! From the day before he was born and 2 days later, I did not sleep a wink. When a friend asked how I was managing, I had no idea. I said “special grace”. I could not get sleep day and night. After that, sleep became scarce, just as well since he has not slept a whole night since he was born, over a year later. That means I have not slept a whole night since he was born. I would not label him as the crying lot but he wakes up in the middle of the night, and so do I. There are other aspects, that seem quite impossible but somehow I have managed. Sometimes I feel pushed to the limit then somehow get some extra strength to do something more. The nights I have had to rush him to hospital and back home at 4.00am, and still manage to report to work. Managing as a parent with other multiple roles and as a single parent is by God’s grace. I have also seen amazing things that have happened in my life that I can only say it is by grace. Sisterhood is global: Many women and men have made great impact in my life over years, many have been there for me during this time but the girls have taken the trophy. During the first months of my child’s life, I received so many guests in my house I lost count. My younger sister Cate stayed in my house for two months and that made my life much easier as she commuted to work from my house and managed my house. Many times, I did not even have the energy to give instructions. That also meant my niece was around to help sing for the baby. I composed songs without realizing and my niece who I think will be a singer when she grows up, learnt the words and tune and sang back to the baby. I cannot remember most of these songs but girl, we sang! Many girl friends were there for me in different ways, reconnected with many that we had been out of touch with and enjoyed quality time with them that was very therapeutic. I got guests I could least have imagined. There is truly love flowing in the world. I got tips on different aspects and generally felt that for sure a child belongs to the community. ‘My village’ did not disappoint but surpassed expectations. Online parenting: yes! Online parenting. I kept wondering how people survived before internet and the village structure was no longer there to support in the everyday aspects of bringing up a baby. Many women came in handy in giving various tips and expertise advice. However, I had underestimated the wealth of information gathered from online sources. This has been so helpful and many times helped in realizing something was normal or in getting tips on how to handle some challenges. Everything is a click away. Sincerity is not enough: Unfortunately well-meaning intentions were sometimes overbearing and I realized being sure of what you are doing and being okay with not following the rules of the book if that does not work for you is quite helpful. Every child is unique and while there are the parameters and various do’s and don’ts’s, there is a place for CIRCUMSTANCES. There are times some of these well-intentioned actions or advice could really get into my nerves. A well-meaning guest when one can barely open their own eyes from fatigue is never good news for a mother of young baby. Questions or remarks and for sure everyone has their own piece of advice. It is a time to also sift and let others things slide. Overall, it has been an amazing journey. 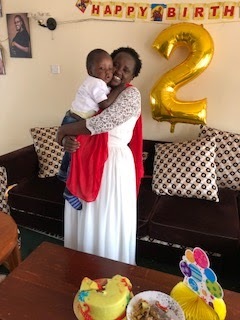 On my baby’s first birthday, I could only whisper, “we have coexisted for a year, we can do this”. Yes, motherhood happened and the minutes to do some of the things I love became scarcer. I blogged over a year ago, and I take longer to finish a book, but I could not trade this experience for anything.